The 10 Best Spots for Wings in South Carolina! Bone or boneless? Flats or drumsticks? Traditional buffalo or an offbeat concoction? Wing lovers may never agree on what makes this comfort food so irresistible. But there’s one thing they can probably all get on board with: These 10 chicken wing hot spots are serving up some of the tastiest wings you’ll find in South Carolina. You won’t understand the delicious impact these wings will make on your taste buds until you try them for yourself. They’ve got nearly every flavor you could want (and a few you might be too scared to try), as well as a choice between boneless and bone-in. They make all their sauces from scratch to create a flavor burst you really can’t find anywhere else. If you wonder why it’s called Fat Jack’s, it might be that Jack got fat because he couldn’t stop eating these savory wings all day (pure speculation, though). At any rate, these wings could easily become the only food you’ll ever want to eat. Order a variety platter and stock your fridge for the whole week. The masters of wing delivery, their motto is “No range is out of range.” Which is great news for folks on the South Carolina coast. And trust us, it is well worth the wait. 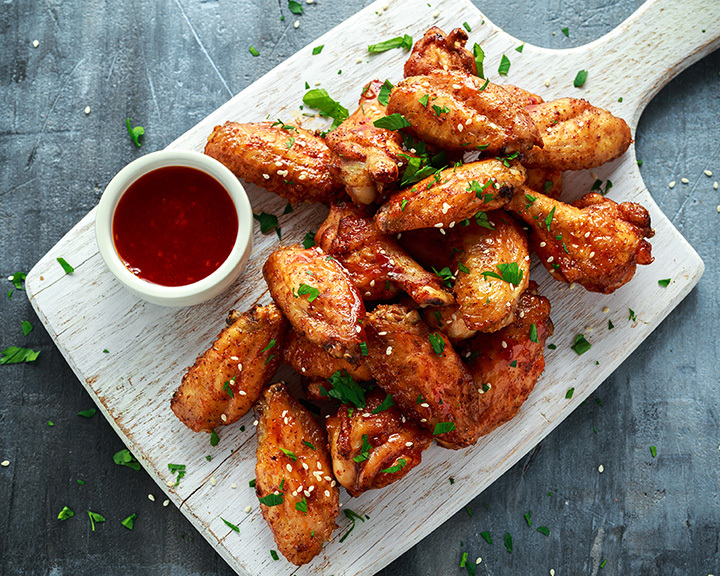 This little eatery is serving up a powerful variety of wings to sate every flavor preference, including unique combinations like their patent-pending Parmeyaki and Garmesan. Eat in, carry out, or get them delivered—either way, you’ll be glad you tried them. No matter what kind of wing style you crave, you can get exactly what you want here. Boneless, bone-in, saucy, dry rubs, spicy, sweet, barbeque—they’ve got every category covered. And make sure you snap a picture with Blue Boo before you leave—he likes the attention. Don’t judge a book by its cover. This little restaurant packs major flavor into their wings. You also get a lot for the price you pay, and certainly won’t walk away hungry. Could there be a better combination than wings and ale? Possibly not. This well-established eatery offers a tasty variety of wing sauces and dry rubs, from spicy or sweet to strange or flavorful. What’s better than an awesome variety of chicken wings? How about an awesome variety of chicken wings that comes to you? Wing delivery isn’t yet a standard practice like pizza delivery, but TNT Hot Wings could be the ones to change that. Claiming to be the best wing restaurant in a college town is a bold statement (because pretty much every restaurant in a college town serves wings, right? ), but these guys have earned that right. Best of all, the prices are reasonable, and there’s plenty of live entertainment to go around. Hot off the food truck, the wings have forever changed the way you will enjoy wings forever, and no other wing will ever stack up. Why? Because… they’re stuffed! Yes, the guys at 2 Fat 2 Fly have done the impossible. Injected with options like cheese, marinara, jalapenos, rice, and other unimaginables, you can stock up at their food truck, or have them shipped to your door (if you live in South Carolina).